On this page find a number of images, questions, and responses about older Speedaire air compressors. Have a look. Is your old Speedaire air compressor here? If you have an oldie and goodie and need a bit of help with it, you can post it, with photos, at the end of this page. I have a pretty old Speedaire 2hp 20 gal portable that I am trying to determine what model pump is on it. I need to order some parts & so far none of the parts I have numbers for have shown up on Grainger such as the belt # (Durkee-Atwood BT-31) or the motor which is a Dayton LR22132. The big problem is that the sticker that had the model # & information on it is now gone. The tank & pump are almost a primer gray in color with a red & silver Speedaire sticker on the non-flywheel side. There is also a darker gray & yellow maintenance sticker on the same side. The model# sticker is up on the shelf where the motor & pump are. It appears to be a 2 part sticker as I still have the Speedaire title part. The pump is a 2 cylinder model that is much like the attached picture except that the middle bolt is recessed onto a box that has the air inlets and is normally covered by felt type of filter. I am not sure if the plates on top of the pictured pump are removable and the box I speak of may be underneath. The pump has a raised inscription that says B 17B. The serial number for the compressor itself starts with 04207. 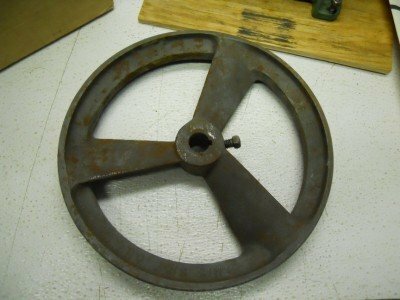 The flywheel looks identical to the 1 in the picture. I have a head gasket leaking & there is air coming out of the weep hole in the top of the housing that the shaft come through at. I am assuming that these may be easy fixes or something that can be solved by rebuilding the pump but really need to be able to id it in order to get the right parts. Identify a pump so I can find valves! This is an old (judging from the fact I found it in my grandfathers shop) air compressor pump. It is green in color, single stage, and the piston is approximately 1.5″ diameter. The only marking on the pump is MODEL A-9. Some photos are attached. Thanks! 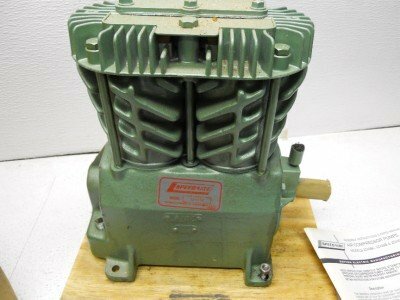 Can you help with Identifying older Speedaire compressors? Add a comment below, or post your own question if you will. Please remember that a new post cannot go live in this forum unless it has at least one, and preferably 4 or 5 photos of the compressor in question, yet you sure can help someone identify their compressor if you can.